Join us in an awesome interactive one-day workshop! 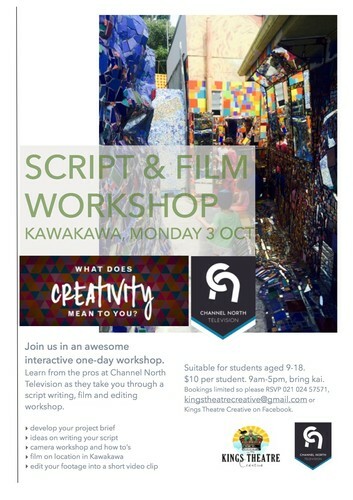 Learn from the Pro’s at Channel North Television as they take you through a script writing, film and editing workshop. Suitable for students aged 9-18. Bring kai. Bookings limited so please RSVP - text 021 024 57571, Message Kings Theatre Creative on kingstheatrecreative@gmail.com.